In 2012-13, Hanover went a combined 17-6 and lost to rival Baileyville B&B both times in the Eight-Man, Division II sub-state championship game. Last season, the Wildcats fell 60-14 to the Falcons, who won back-to-back state championships before they closed doors last May. Hanover returned seven starters on both sides of the ball, the majority of them seniors. After the B&B loss, the Wildcats focused on clearing the sub-state obstacle and heading to Newton. Last weekend, coach Matt Heuer said Hanover carried a “business-like attitude” in its sub-state championship road game against Osborne, the defending Eight-Man, Division I state champions. Hanover beat Osborne by 28 at home in Week 9. This time, the Wildcats won 74-44. On the west side, Central Plains posted 9-2 seasons in 2011 and ’13 but lost in the second round each time. This year, a junior and senior-laden squad won a thriller, 42-40, against Spearville in the second round and controlled the sub-state game in a 32-0 victory versus Ness City. On Saturday, the Oilers and Wildcats, both 12-0, will meet in the state championship at Newton’s Fischer Field. Game time is set for 3:30 p.m.
Hanover has won titles in 1979, ’08 and ’09 and finished second in ’07. Only the 1978 team has ended with a perfect season. The Wildcats have scored 724 points and have a chance to break the state record of 760 set by Osborne last season. Senior quarterback Andrew Bruna, senior running back Preston Jueneman, and senior ends/linemen Cody Rengstorf, Hunter Nicholson, Evan Zabokrtsky, Austin Diederich and Ethan Fritschi are among the team leaders. Bruna has passed for 1,668 yards with a 33/3 TD/INT ratio and leads the squad with 725 yards and 24 scores. Hanover runs from multiple sets, including 23 different formations against Osborne, according to Heuer’s charting. Fritschi has blocked three punts; he had Diederich each have six sacks. Zabokrtsky has 915 receiving yards and 19 touchdowns, and seven sacks. 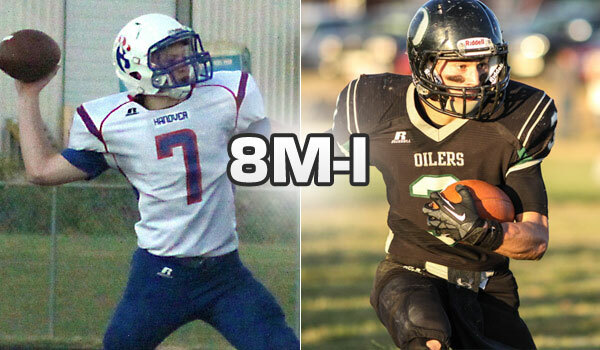 Hanover has the size edge on Central Plains, but the Oilers have been smaller than virtually all of their opponents. Instead, Central Plains has used athleticism and great leverage en route to outscore opponents 612-102 and easily rank No. 1 in scoring defense. The Oilers are tied for second in scoring offense. Senior wide receiver Layne Bieberle broke the state eight-man record for career receiving touchdowns with two scores last week against Ness City. He now has 55 in his career on 111 catches. In the summer, Bieberle went to several camps and improved on his route running. Junior quarterback Braedan Crites had 38 passing TDs in each of the last two years. Bieberle also has 20 career interceptions with 4,621 all-purpose yards (1,701 this season). He has exceeded 1,000 receiving yards in each of the last two falls. Every starter on Central Plains is a junior or senior, save sophomore starting left guard Trey Schulte, who Steiner called the team’s probably biggest surprise. "He has fought through injuries this year that some kids would have went out on," Steiner said. Both teams had several quality early-season victories. Central Plains beat Victoria and Little River, and Hanover knocked off Axtell and Wakefield. But Steiner didn’t truly feel his team was state-caliber until the last-second win against Spearville. For Hanover, the first Osborne victory gave the Wildcats another lift after a dominant first two months. Last Friday, Hanover pulled away early in the fourth quarter versus the Bulldogs en route to the long-awaited trip to state.